AEM Analog Gauges UNIVERSAL - MiataRoadster - Stay tuned with MiataRoadster! AEM’s Boost gauge unites unsurpassed accuracy, speed and control with an easy to read, analog interface. The AEM analog gauge also offer a 0-5v analog output for use with data loggers and virtually any engine management system, such as the AEM EMS or FIC. The Boost gauge features a AEM 35psi brass sensor, making it among one of the fastest and most accurate gauges available. The backlighting is user adjustable to 7 colors, allowing users to easily match the Boost gauge to most factory gauge clusters. Each gauge comes with interchangeable black & silver bezels and is available in black or white gauge faceplates. AEM’s EGT gauge unites unsurpassed accuracy, speed and control with an easy to read, analog interface. The AEM analog gauge also offer a 0-5v analog output for use with data loggers and virtually any engine management system, such as the AEM EMS or FIC. The EGT gauge features a K-Type Thermocouple, making it among one of the fastest and most accurate gauges available. The backlighting is user adjustable to 7 colors, allowing users to easily match the EGT gauge to most factory gauge clusters. Each gauge comes with interchangeable black & silver bezels and is available in black or white gauge faceplates. 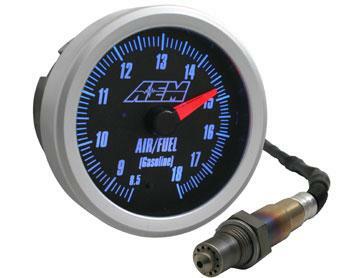 AEM’s wideband air/fuel gauge unites unsurpassed accuracy, speed and control with an easy to read, analog interface. The AEM wideband also offers a 0-5v analog output for use with data loggers and virtually any engine management system, such as the AEM EMS or FIC. The system features a Bosch sensor with an accuracy of .1 AFR, making it among the fastest and most accurate widebands available. The backlighting is user adjustable to 7 colors, (white, blue, green, red, orange, light blue, and aqua), allowing users to easily match the wideband gauge to most factory gauge clusters.